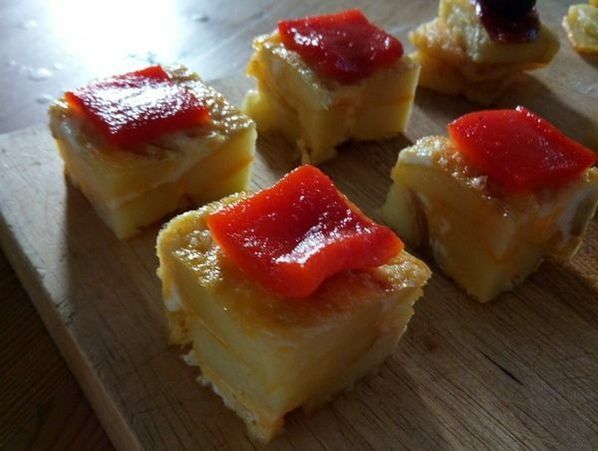 You can have canape, starter platters, starters, and then there are desserts: and that is just the food! 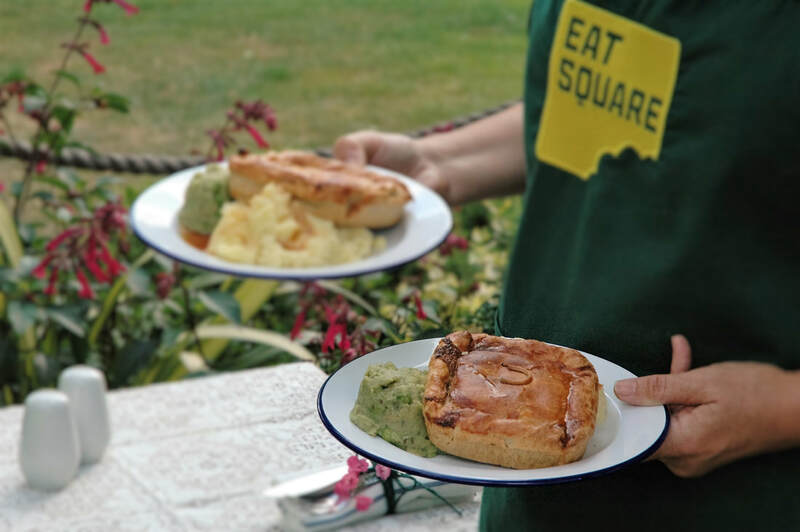 Eat Square offer you more than just a selection of award winning pies. You can choose the type of plates, service and style. You can have a buffet or waited table service. 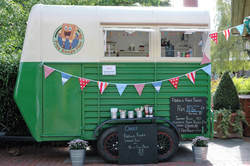 Have our pie and mash trailer at your outdoor event. 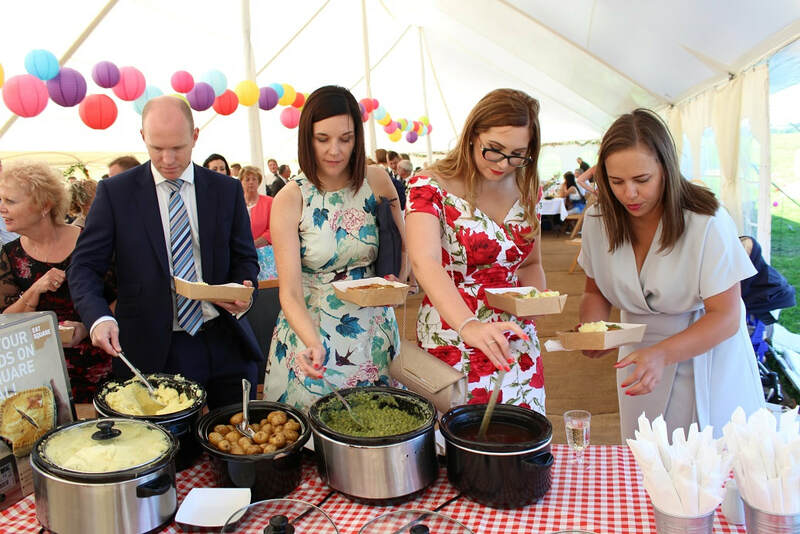 Choose desserts, starters, canape and must more... read on to see some of what you can have at your wedding. 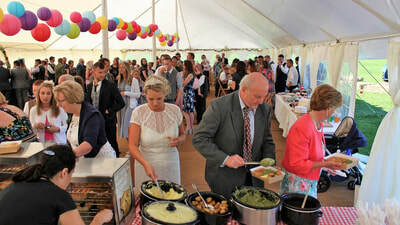 For a detailed wedding catering quote - please use the form found at the bottom of this page. 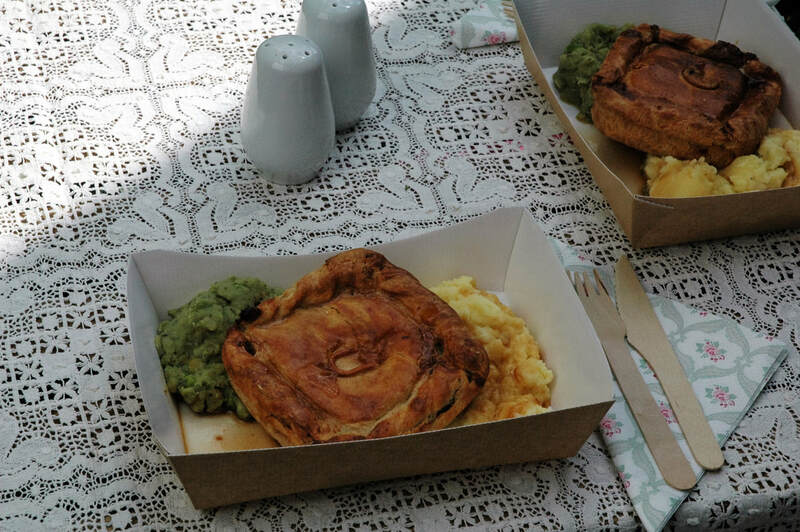 You have a choice of pies from our regular menu and seasonal specials. Choose from our range of traditional short crust pastry pies, or our gluten free pastry pies. 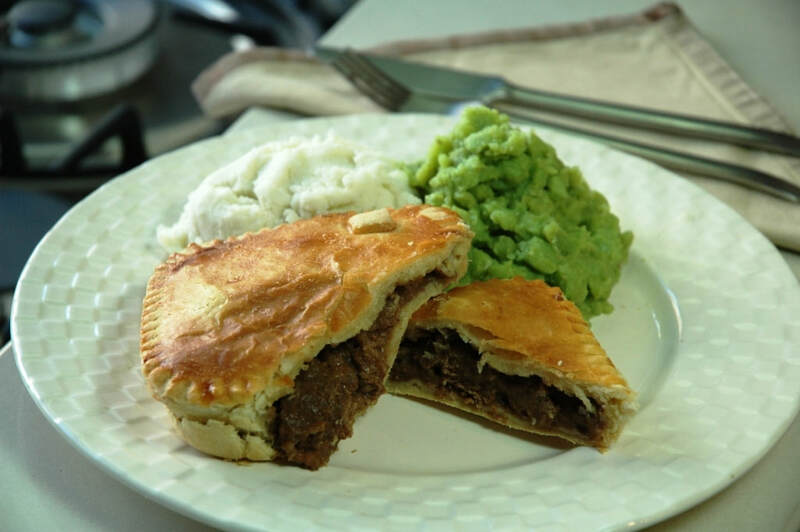 Choose from our range of traditional pies. Our most popular pie is steak and ale but we can do special orders if there is something you would really like on your menu. You can also pick one of our seasonal specials such as spring lamb with a hint of mint. 34% of people now avoid one type of food or another. This can make planning wedding catering a headache. Not with Eat Square as we offer your guests gluten free, dairy free, vegetarian and vegan pies. Want to keep it a little lighter? 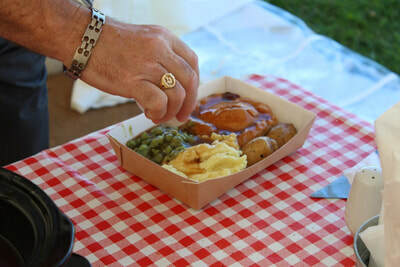 Choose a cold pie (pork or game perhaps), potato salad and coleslaw or green salad for your summer wedding. 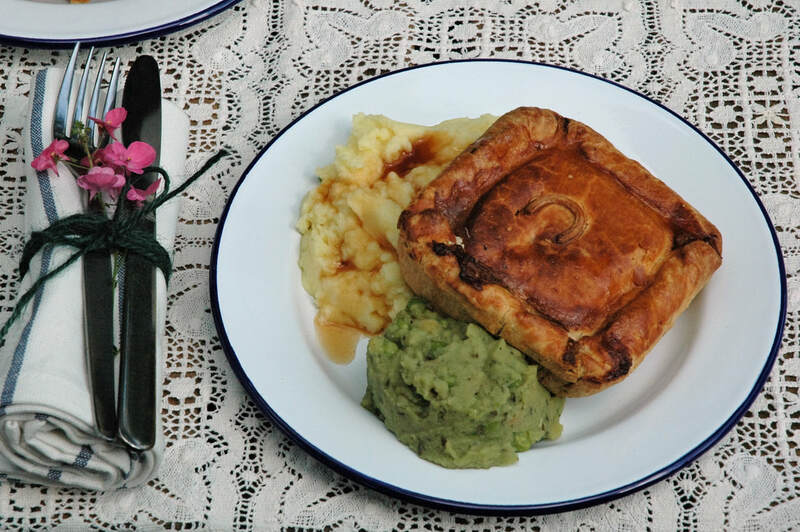 We can make special pies to suit your needs...﻿just ask us﻿. 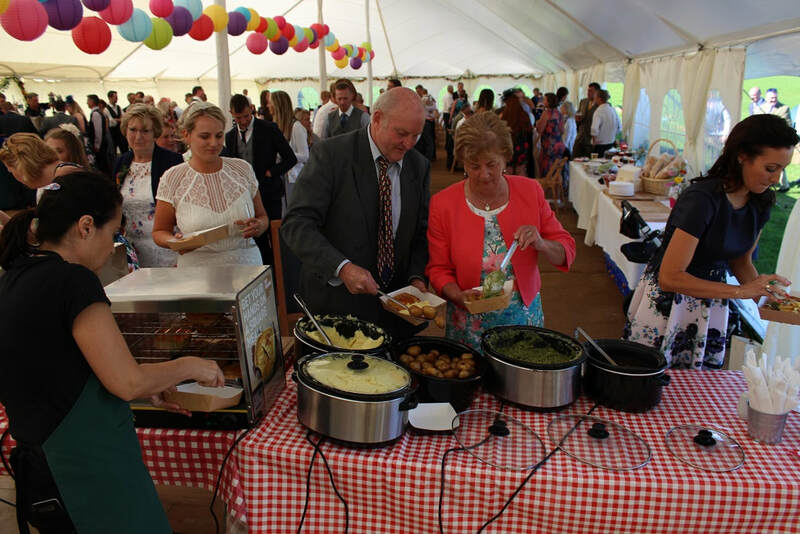 No matter where your wedding is we can cater it. 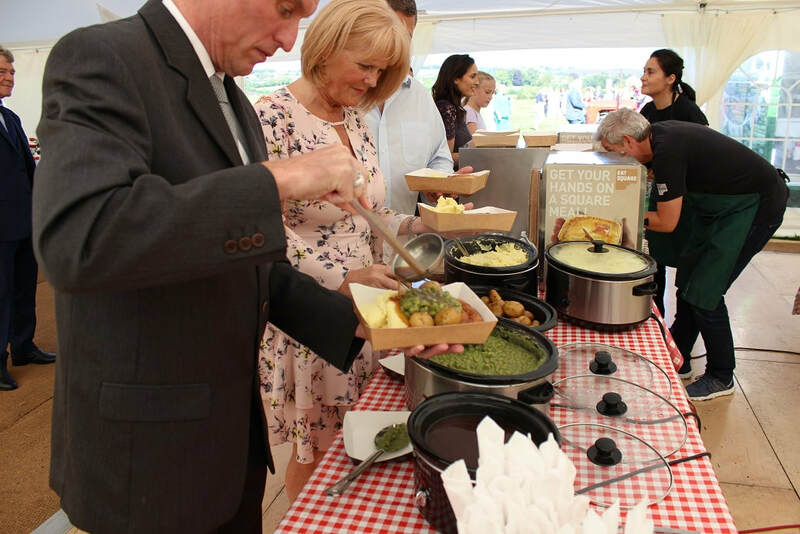 We can operate in established kitchens at venues with full catering facilities. 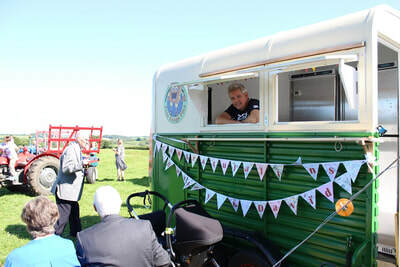 Or we can bring our converted horse boxes (see pie and mash trailers for more information). 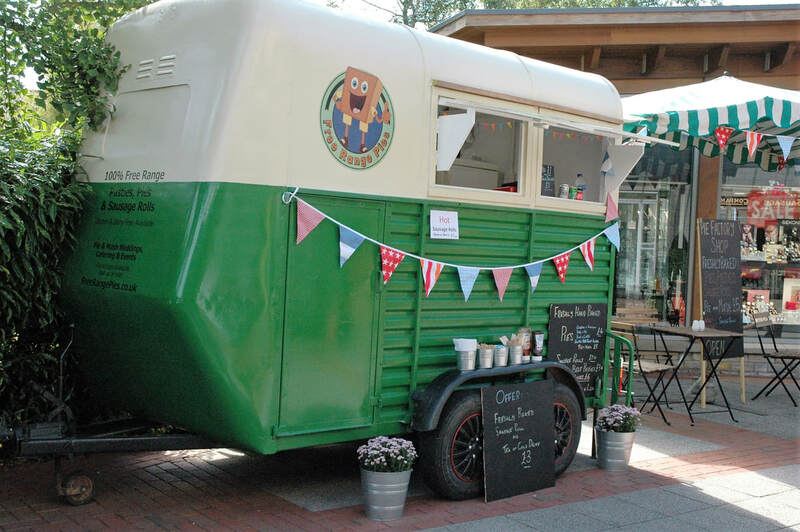 The trailers add some style and retro feel to the event. 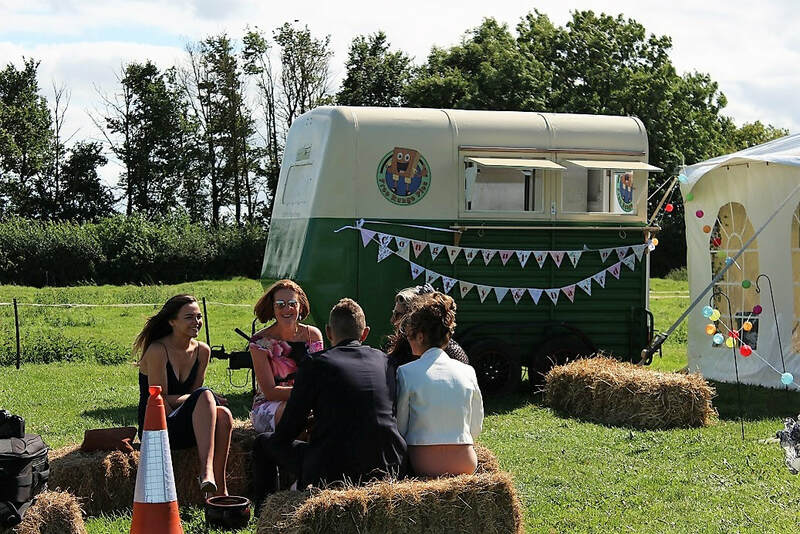 We also have field kitchens that can be set up in the middle of nowhere (a field for example) and operate with no onsite facilities. This is something we get called on to do a lot as more people hold weddings in the countryside with a rustic theme. 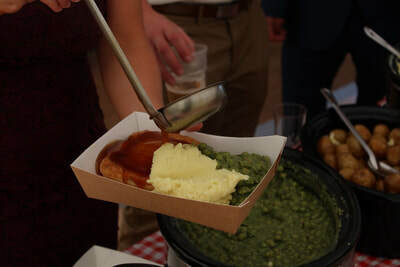 Buffet pie and mash is the most economical way to serve guests. 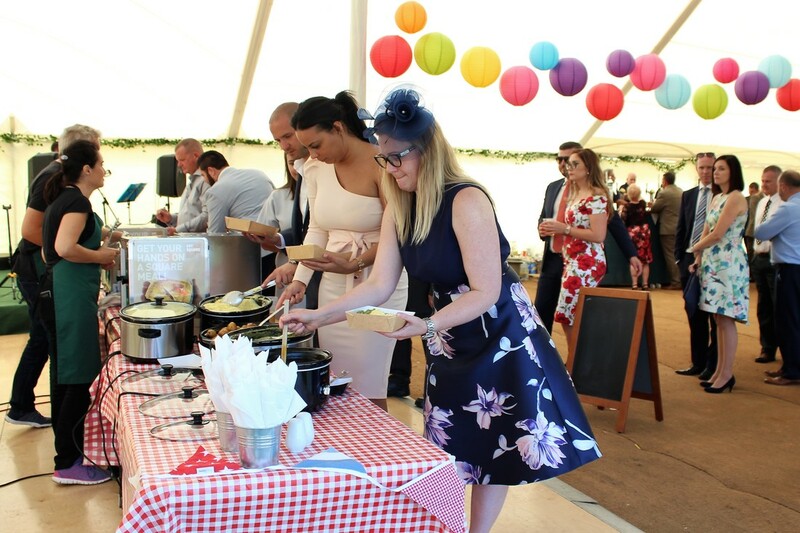 Our waiting staff can serve to your seated guests in a traditional style. 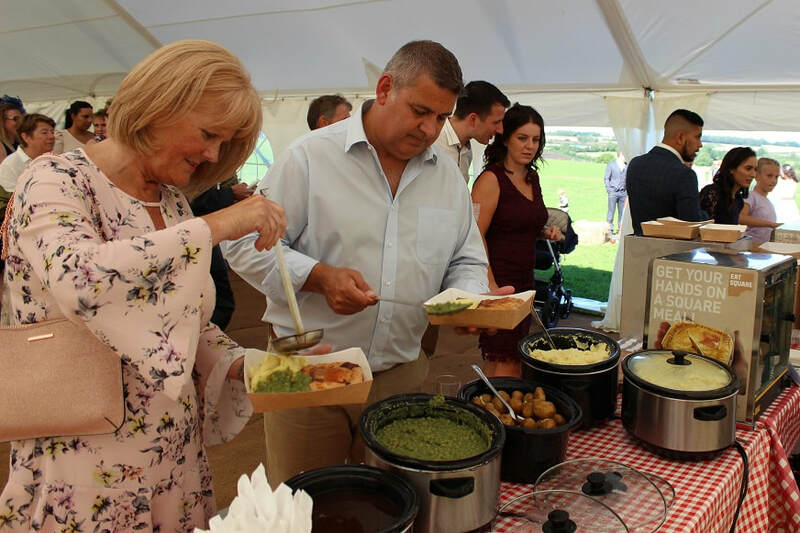 Our field kitchen can operate almost anywhere as a buffet or for table service. 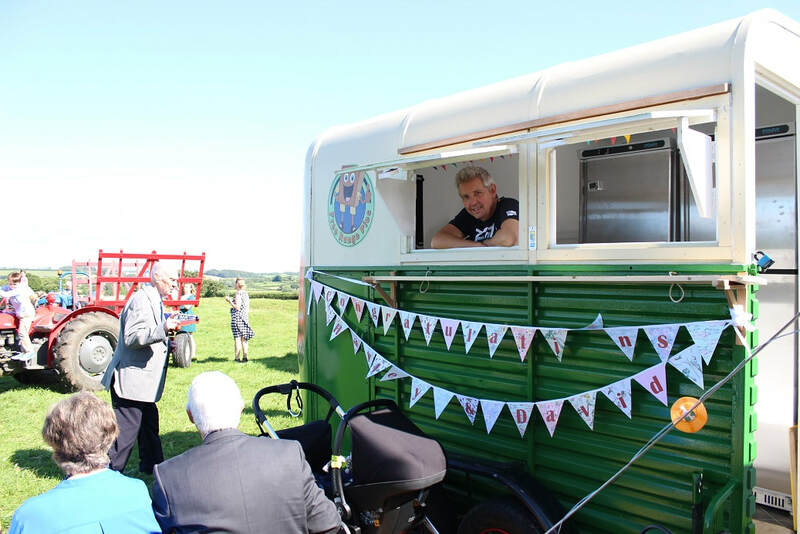 Retro pie and mash trailers can operate anywhere there is vehicular access. Pick how you would like your pies served. Eat Square offer disposable plates and wooden cutlery; standard white plates with steel cutlery and paper napkins or blue rimmed enamel plates with steel cutlery and large cloth napkins. 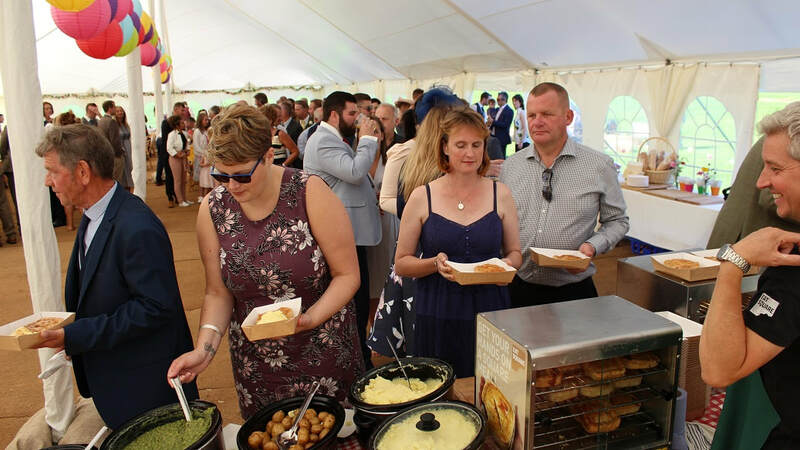 A great alternative to a starter and less formal, canape are a great way to keep your guests happy as they arrive and before they sit for the breakfast. 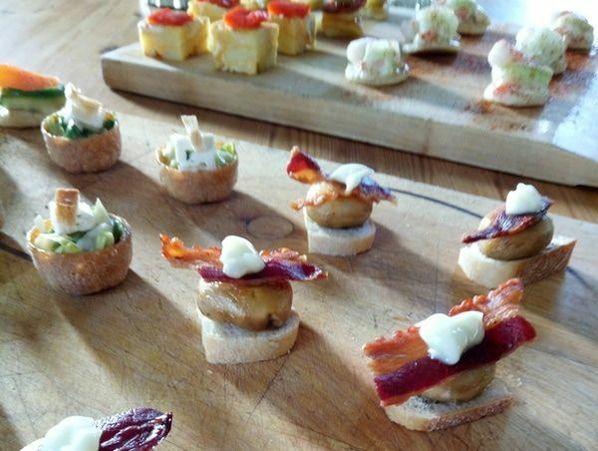 Typically you can choose a selection of 4 canapes for £5 a head and each guest would have at least one of each provided. An ideal starter for a wedding breakfast is a platter. Typically Eat Square create platters that serve 5/6 people. So if you have tables of 10 or 12 we would put 2 platters on each table. 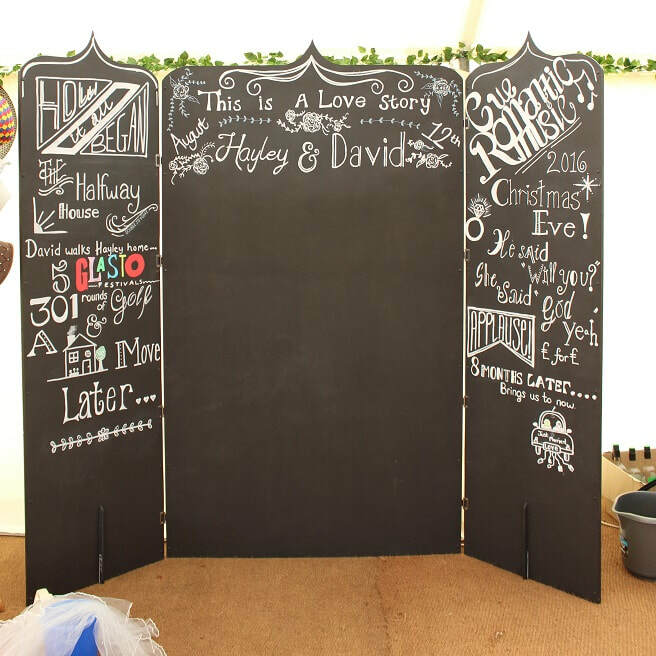 You can choose from the platters below or have something made especially for your special day. Platters cost around £5 per person. Mediterranean Platter of meats, flavoured Italian breads, stuffed olives and vine leaves. Traditional British Platter, with pork pie, pate, bread rolls, scotch egg, pickle and pickles. Smoked Salmon and Goat Cheese Platter with flavoured breads or assorted bread rolls. Desserts... something sweet to end on. Not everyone goes for dessert as you may have a special cake to share with your guests. But a traditional wedding cake is no substitute for a special sweet. You can come to a tasting on a Wednesday or a Friday at 3pm or 6pm. They do get booked up though so be sure and ask us in advance. Once you have confirmed a date with us you will need to pay a refundable deposit of £20. You can do this by following this link. 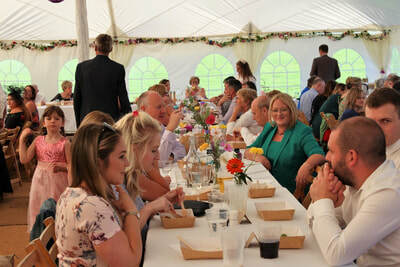 A large marquee in a field in Somerset was the location for this wedding. 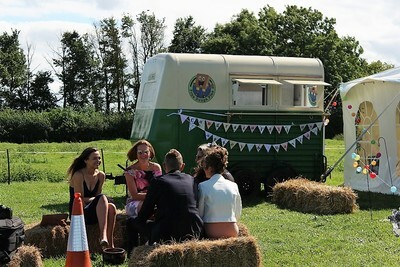 With a farm theme the guests arrived sat on bails of hay on trailers pulled by vintage tractors. Originally planned as an outside buffet from the horse box, we had to relocate inside to the dance floor due to high winds... but we adapted and all went well. We managed to serve all 160 guests in about 50 minutes and the roast new potatoes were a huge success.